Cheers to Belgian Beers has been one of the most interesting Portland festivals during the last few years. A great example of the friendly rivalry of Oregon brewers, most of the beers at the festival are brewed with the same yeast, chosen by the brewer who won the peoples' choice vote at the previous year's festival. The beers are usually one-offs that might never be seen again, and give the brewers a chance to step outside of their usual lineup, or to flex their muscles with styles they particularly enjoy. Proceeds from the festival are donated to charity. Saturday's Cheers to Belgian Beers 2011 had even more advantages going for it. 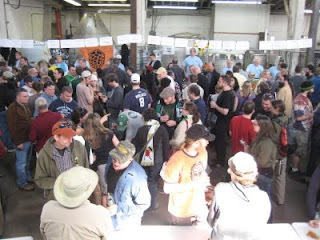 Since the 2010 contest was won not by a Portland brewer but by Corvallis' Block 15, the venue for this year's festival was brewery equipment manufacturer Metalcraft Fabrication, and the yeast that Block 15 chose for the competition was the versatile and flowery Westmalle Abbey yeast. Holding the event at Metalcraft turned out to be an inspired choice: the big, airy warehouse comfortably held the crowd, and there was even more room in the fenced yard outside, along with mobile food from Philadelphia's and Koi Fusion. There is a yellow-line MAX stop not far away, and the warehouse is right beside the Interstate bike lane. PORTLAND, Ore. (May 4, 2011) More than 1,500 beer fans attended the 2011 Portland’s Cheers to Belgian Beers festival at Metalcraft Fabrication on Saturday, April 30 and selected Hopworks Urban Brewery’s Muscles from Brussels and Logsdon Organic Farmhouse Ales’ Seizoen Bretta as the People’s Choice champions. As the winners of the 2011 competition, Hopworks Urban Brewery and Logsdon Organic Farmhouse Ales earn the right to select the yeast strain for the 2012 event. “This is the first year we’ve had a tie in the People’s Choice voting,” says Oregon Brewers Guild Executive Director, Brian Butenschoen. “It’s incredible to see how this festival has grown as public appreciation for Belgian styles and flavor profiles increases." The 2011 Portland's Cheers to Belgian Beers festival marked the world debut of Logsdon Organic Farmhouse Ales. This is the second time Hopworks Urban Brewery has tasted People's Choice victory, the brewery also took home the coveted prize at the 2009 festival. The top five spots (including two ties) in the voting went to: Ambacht Brewing Honey Triple, Big Horse Brew Pub Bear's Choice, Block 15 Brewing Co. St. Macarius, Breakside Brewery Brewers Bramble, Cascade Brewing Co. Chuggeté Pucker, Hopworks Urban Brewery Muscles from Brussels and Logsdon Organic Farmhouse Ales Seizoen Bretta. Hold on just a second: as Charles noted in the comments, Cascade's entry was not brewed with the contest yeast. So how can they be in the running? I only had a taste of Block 15's chocolatey entry, and while neither it nor Breakside's Bramble really rung my bell, they were tasty and I can see how people would vote for them. I didn't try the Big Horse entry, so I don't know how it was, but I'm kind of confused that so many people liked the Ambacht Tripel, which wasn't flawed, but wasn't all that great, and not really much like a tripel, either. Anyway, congrats to Hopworks and Logsdon! Hopefully in the future the program will reflect more information like the yeast strain used. As always, nice post Bill.